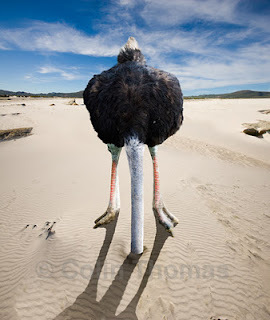 Ostrich time for E-Commerce Companies in India? It sure does seem simple and this is what 90 %(a conservative figure) of e-commerce sites are doing. This is exactly the reason for many ‘passionate’, ‘dynamic’, ‘Alumni from II (Insert your favorite alphabet) ‘ jumping on the bandwagon with generous VCs giving them tickets. Now let’s analyze some of the trends in this scene. 1. Creating Niche segment – Do this simple exercise. Make a list of all the product categories and sort them according to need-for-look-and-feel in descending order. On the top you will have Jewelry, Home Décor, Apparels and on the bottom you have Books and Electronics and many other categories lying in between these two extremes. Amazingly, the number of e-tailers catering to all these categories from top to bottom is equally distributed. The top ones try to cater to the niche segment and the bottom ones think they have a large market to cater. Both are failing miserably, because people do not trust sites on the top for their luxury needs and the bottom ones cannot compete with each other on price. Some shut shop before anybody notices it while some try to expand their product lines forgetting what they wanted to be initially. Examples being daily deals site becoming an e-tailer and vice versa and creating multiple domains for every segment. 2. Carrots – Register and stand a chance to win a iPad 2. Pay Rs.50 and get Rs.500 off (90% off) on your purchase at metoo-commerce.com. Needless to say, terms and conditions apply. Rs.250 off on your next purchase for every referral is again a common strategy. Only people who think these strategies work are the BD Guys. The reason they think it would work is that somebody else is doing. Of course, who wants to be called old-school? There is definitely a need to innovate in user acquisition, far more than accumulation of likes on Facebook fan pages, again in return of Rs.500 gift points. 3. Some more signs – What should you say when ‘popular’ e-commerce site start selling bikes and cars online!!! Of course, you cannot pay online for those but you can leave your phone number to get a prompt call from the dealer. e-commerce or a wannabe craigslist, left to your imagination. Open your spam folder and Google any e-commerce name you got email from, and look for the reviews. You will most probably find the reviews in 80/20 proportion, 80 being bad and 20 being good, among whom again 80 being engineered and 20 being genuine ones. 4. Daily Deals – The list won’t be complete without this. Go to any of the daily deal site and take a critique look at the deals. You may find hundreds for each city. Now read the details of the deal and try to arrive at a price for the product/service. You can’t. Pay Rs.199 and for a Health/Dental/Spa/Astrology/Vehicle service worth Rs.2999. Does it really mean that the service is worth Rs.2999. No. There are hardly any deals that you can call them as genuine deals. The reason that deal sites won’t work, at least for now, is that we Indians are deal-hunters, not deal-givers. Hardly any e-commerce player is making money. Still it is good for the ecosystem. There are Web firms, ERP and CRM providers providing customizations according everybody’s “unique” model. There are ad agencies and PR firms making money, not to forget ads ka baap, Google. Courier services have found a new revenue stream while newer ones are emerging exclusively for e-commerce. Of course, the customers are able to get products cheaper, thanks to the price wars. It feels really great to see many world-class SaaS companies starting up in India to cater to e-commerce. I completely believe that e-retailing is here to stay. But once the tides are down, we will know the reality. I give 2 years for this to happen starting from today. Only handful will survive who have invested in infrastructure, including warehouse, logistics, technology and payments. Rest will come out of their ostrich time. We cannot expect any government regulation promoting e-commerce, though we can wait till FDI in retail gets a clearance and see a bloodbath.